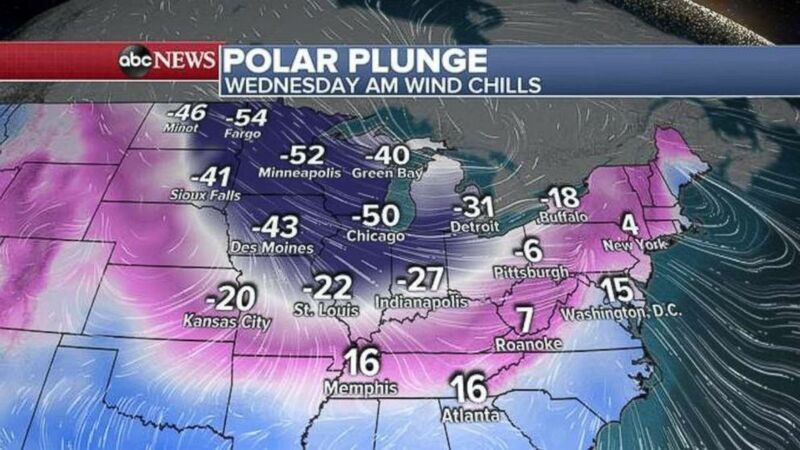 Chicago could see a wind chill of minus 50 degrees on Wednesday. Major cities including Chicago and Minneapolis, already covered in snow, may come to a standstill as brutally cold temperatures hit. It's technically summer in Antarctica, and it's warmer there this week than in Chicago. The Southeast is also seeing snow and freezing temperatures -- and soon, the awful wind chills will also strike the Northeast. 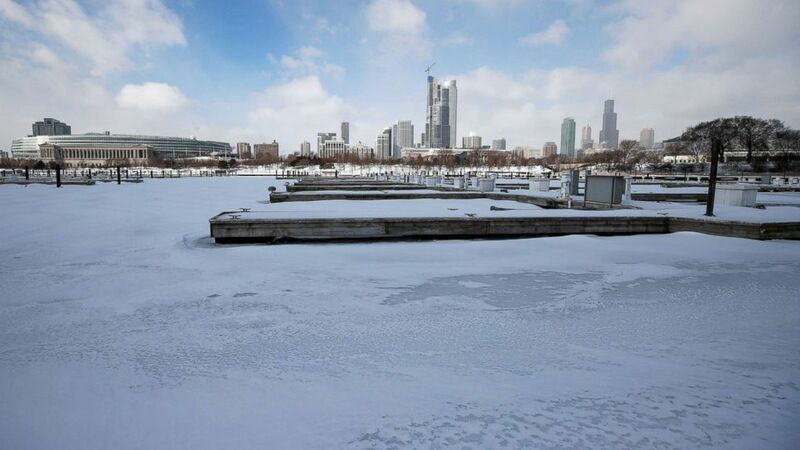 In Chicago, doctors at Northwestern Memorial Hospital "have already seen individuals who have lost fingers because of the current temperatures," Dr. George Chiampas told ABC News. "Unfortunately, we expect that number to rise," Chiampas said, calling this week’s freeze unprecedented and dangerous. (David Joles/Star Tribune via AP) Frost covers part of the face of University of Minnesota student Daniel Dylla during a morning jog along Mississippi River Parkway, Jan. 29, 2019, in Minneapolis. A snowstorm wreaked havoc in the Midwest, dumping over 1 foot of snow in Michigan and Wisconsin and leading to car crashes and canceled flights. 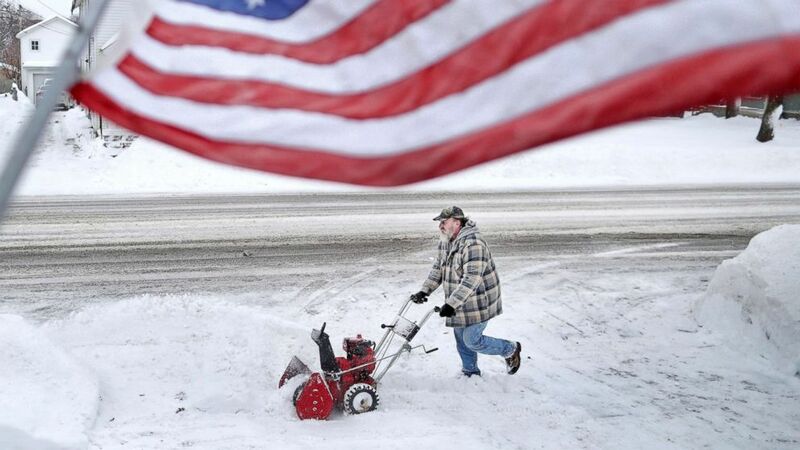 (Anthony Wahl/The Janesville Gazette via AP) Jan White clears snow from his driveway, Jan. 28, 2019, following a winter snowstorm that made its way through Janesville, Wis. But the Midwest isn't out of the woods by a long shot. Dangerously cold air -- the coldest in decades -- is headed to the Midwest Tuesday night into Wednesday morning. 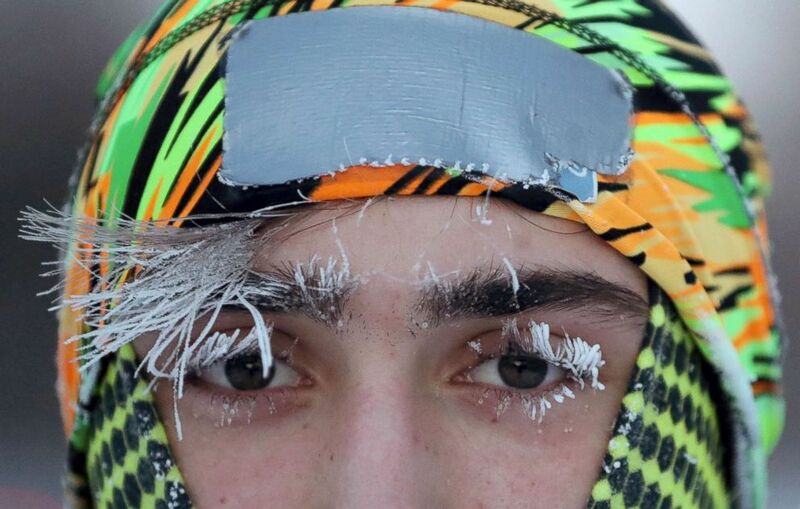 In Minneapolis, where public schools are closed, the city is forecast to have a wind chill of minus 52 Wednesday. If Minneapolis reaches wind chills below minus 49 degrees, it'll be the coldest reading there since 1989. That's a massive contrast from the warmest temperature on Earth. In the last 24 hours, that record fell to Augrabies Falls, South Africa, where it was 114 degrees. And the cold is expected to linger -- the Thursday morning wind chill is forecast minus 42 degrees in Minneapolis and minus 46 degrees in Chicago. The temperature is expected to remain below zero in Minneapolis until Friday morning and below zero in Chicago from Tuesday to Thursday afternoon. "I don't want to go outside, but I'm a dog walker, so I have to," Chicago resident Mike Canjami told ABC News. "I'm from Boston. I thought Boston was pretty cold -- until I came to Chicago." (Kamil Krzaczyndki/EPA via Shutterstock) Judd Goldman Sailing Center is covered in snow and ice along Lake Michigan in Chicago, Jan. 29, 2019. Canjami said he's concerned since he hasn't experienced minus 50 degree wind chills before. "No matter how many layers you have on, the wind pierces through," he said. Illinois Gov. J.B. Pritzker has issued a disaster proclamation for the state. But Chicago resident Stephanie Skunda told ABC News, "I don't think I'm that worried." "I know when to go outside and when to not, how to bundle up. I'm actually one of the ones that braves the weather and walks on the lake because it's beautiful out there in the winter months," she said. "But I think it's important to make sure you're keeping kids inside. ... There is a panic of commuting 'cause Chicago is a very big commuter city. Some people don't have the option to not go to work." "It's just important to stay safe and help people when you can," Skunda said. "The people who are on the streets and don't have a home to go to, you think about those people." Michigan Gov. Gretchen Whitmer also declared a state of emergency. "Such widespread, extreme conditions have not occurred in Michigan for many years and it is imperative that we are proactive," Whitmer said. Winter weather advisories extend to the Southeast where parts of Georgia, Alabama and Mississippi saw a dusting of snow. Alabama Gov. Kay Ivey issued a state of emergency. "Travel conditions could be negatively impacted Tues & Wed mornings," the governor warned on Twitter. "Please avoid travel if possible, & be very careful if you do have to get out on the roadways." Nashville may see a wind chill of 12 degrees Wednesday. In Atlanta, where preparations are underway for the Super Bowl, the wind chill could fall to 16 degrees Wednesday. By Tuesday night, rain will change to a quick blast of snow from Virginia to Philadelphia to New York City to Boston. Some areas mainly north and west of the cities could see 1 to 3 inches of snow. Heavy snow is expected to fall Tuesday through Wednesday morning for the interior Northeast and northern New England, where 6 to 12 inches of snow is possible. The storm brings the potential for ice, high winds and blackouts, New Jersey Gov. Phil Murphy warned as he urged Garden State residents to use common sense and caution while driving home Tuesday. 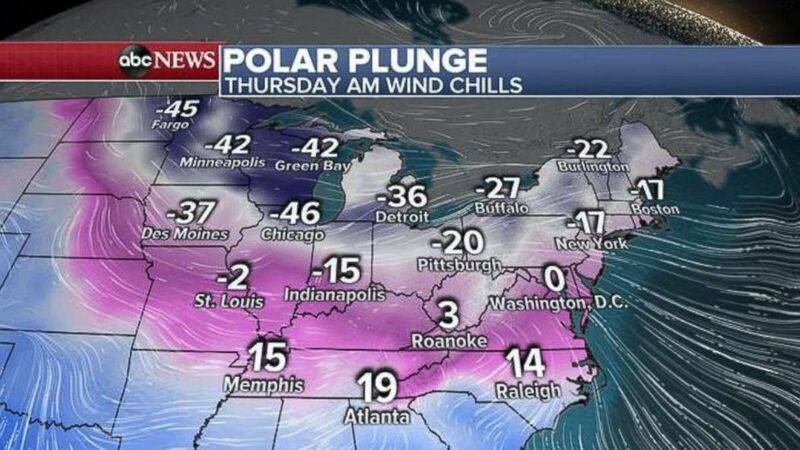 For Northeast residents, the brutal cold will be at its worst Thursday morning. Wind chills will fall to minus 17 degrees in New York City and Boston and minus 27 degrees in Buffalo. ABC News' Alex Perez, Andy Fies, Susan Caraher, Brendan Rand and Heidi Jensen contributed to this report.